‘Fashion can be used as a cultural translator and a tool against colonisation; it re-establishes the balance between symbols, stories and different worlds through style.’ – Stella Jean. 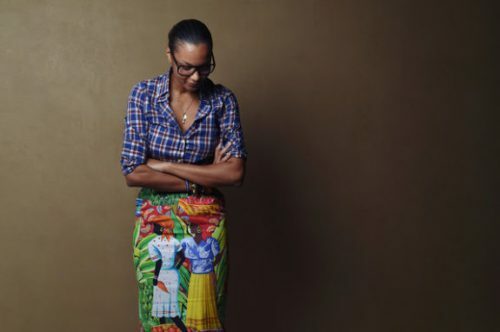 The story of Stella Jean’s heritage is the story of her style. Roman born with Haitian roots, each of these influences appear in her collections to, as she says, ‘embrace’ each other. The ubiquitous stripes are an homage to her father’s origins in Turin, while the bold prints and textiles hint at her Creole ancestory. For her S/S 2018 collection, Jean was inspired by Bolivia’s Cholitas luchadores community. These are women wrestlers who wear native dress while performing their fierce moves, but have often faced discrimination for doing so. Not allowed in some public spaces due to their refusal to wear western clothing, they have garnered attention for this mistreatment, all the while waving the flag for their country’s indigenous heritage. In Jean’s SS18 collection currently in Poepke, native Bolivian-style prints adorn jackets and dresses, her father’s stripes appear on shirting, as does tie-dye, and there’s a coloured petticoat-skirt just like the ‘fighting goddesses’ wear. To shop our range of Stella Jean, visit here.